Before you can upload a geotagged photo to Google Earth, you first have to tag it with the geographic location where it was taken. There are many ways to geotag a picture. One of the easiest ways to geotag digital photos is to let the camera do it for you. Many cellphones that are GPS enabled will automatically geotag pictures taken with the camera phone. Another common way to geotag photos when you aren't too mobile is to download your files to a GPS enabled laptop or netbook after each session of picture taking. The computer will geotag all of the imported files for you. For digital photographers on the go using a DSLR, solutions are trickier. Geotagging a picture taken with your Canon DSLR or Nikon DSLR is not automatic. These cameras have so many battery-draining features and gadgets stuffed into them that a GPS system is not included. Most photographers rely on a standalone GPS device that not only gives your current position, but also tracks your position along the way. Automatically geotagging your pictures as you go about photographing cool places in Utah or photographing beautiful places in Montana isn't as easy as flipping a switch on your DSLR. By synchronizing the clock on the GPS tracker with the clock in your digital camera, you can match up the location on the GPS device with timestamp of the digital photograph. Programs like GPicSync and others will geotag pictures automatically from the matched up data. Photos may be manually geotagged as well. This is most common for photographers who have a handful of great images that they want to tag or who are reconstructing a vacation and will be able to pinpoint well-known locations after the fact. While there are many software packages and utilities that allow you to geotag your photos, the easiest way to geotag a photograph and then upload it to Google Earth is to use Google's own Picasa photo management and editing program. The pictures displayed within Google Earth do not come from within Google Earth itself. Rather, they are overlays of different information services that may be viewed within the context of Google Earth. The only imagery in Google Earth is the actual images of Earth. When most people talk about uploading photos into Google Earth, what they mean is uploading pictures to Panoramio. Panoramio is a Google owned service where users share photographs that are linked to specific locations. Uploading geotagged photos to Panoramio shares them online with all users of the service. Additionally, there is a built-in layer in Google Earth that allows one to view the photos from Panaramio within Google Earth. This is how you can upload your own pictures and see them in Google Earth. You can manually upload photos to Panoramio, or you can upload them from within your Google Picasa account. In order to upload photos to Google Earth via Panoramio from Picasa, the picture must be both tagged with a location, and in a publicly accessible album. To upload your geotagged photo just click the "Upload to Panoramio" link beneath the map when viewing your picture. If you have not linked your Panoramio account — or you do not have one — you will be prompted to login again and choose a username for Panoramio. Then, your photo will be uploaded. Photos uploaded are reviewed before being published to Google Earth, so your picture will not appear right away. Once your picture has been approved and Google Earth has been updated you can check out your geotagged picture in Google Earth. To view your geotagged photo that you uploaded in Google Earth, start the Google Earth application. 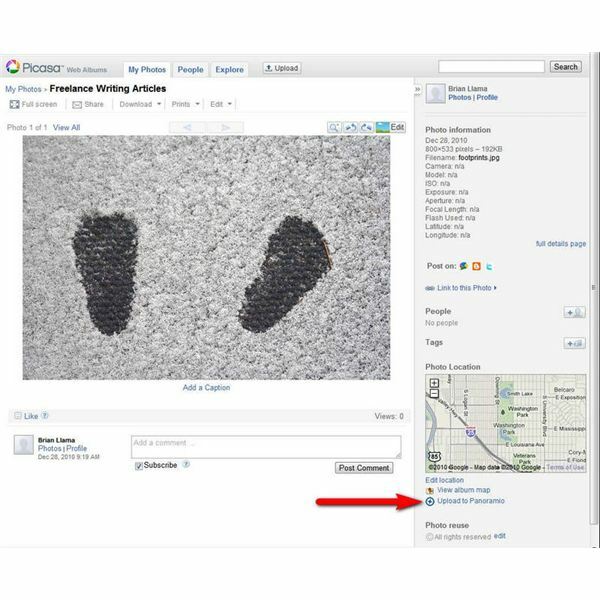 Zoom in to the location of your photograph and you will find the digital photograph that you uploaded into Google Earth.